A five-minute walk away at Margaret’s farm, the cows were being let out to summer pasture. I’ve written about this annual event in the Priory calendar before (see ‘A Stampede of Cows‘). So, here’s just a handful of photos of a spectacle I always enjoy. 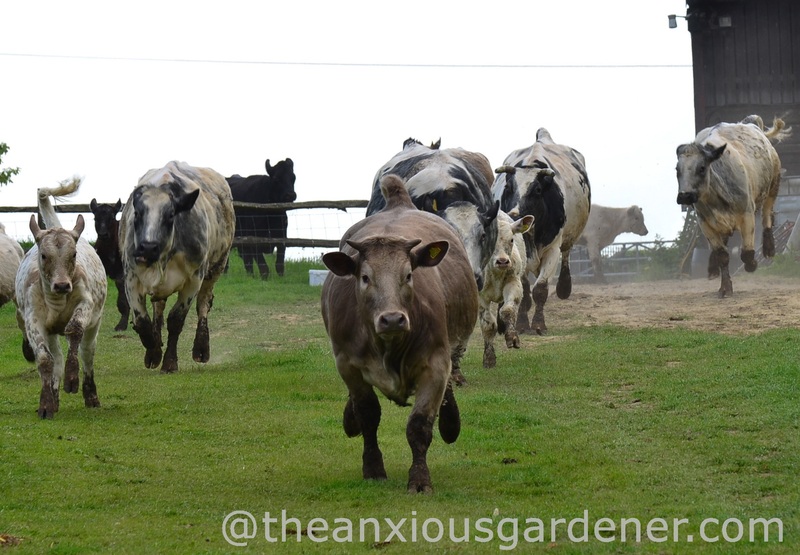 After several months indoors, the cattle’s exhilaration at being released is thrilling to watch. And amusing too. But it is less so when all that separates me from a herd of galloping, huge beasts is a thin hedge. Margaret and I watched them sprint down into the fields above the Priory. It always makes us smile. But I don’t need thudding hooves as a reminder of springtime. 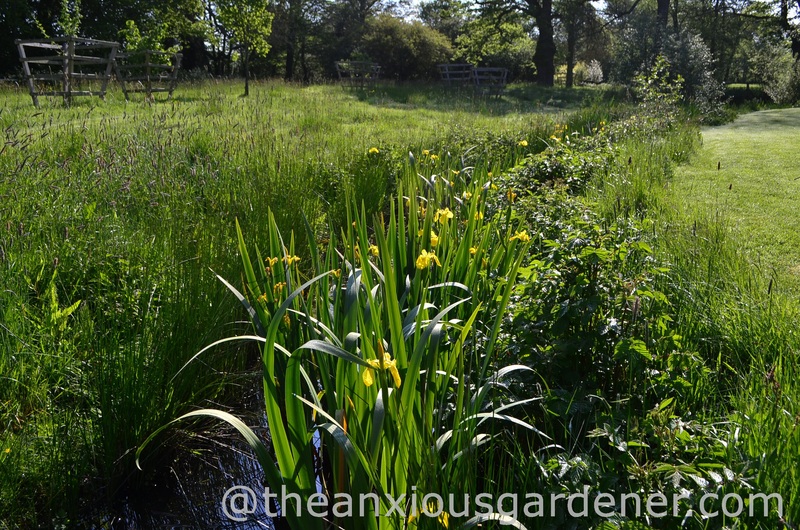 The gardens are a giddy green swirl and I find it difficult to keep up with all that is going on. as is the slow spread of cow parsley on the meadow. 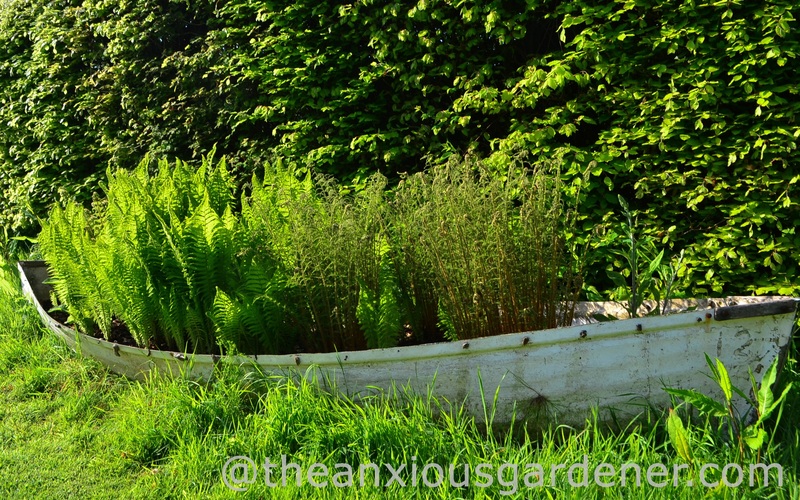 My ‘Fern Boat’ is …. well, full of ferns. Though I’ve added foxgloves too. The shuttlecock ferns (Matteuccia struthiopteris) are at their best. Unlike these Musa basjoo bananas; I’ve only recently stripped away their frost protecting, straw jackets. I hadn’t realised that shuttlecocks are so invasive. Though I remove loads of the blighters, there are always plenty more popping up from their underground ‘suckers.’ Here they jostle a hosta. 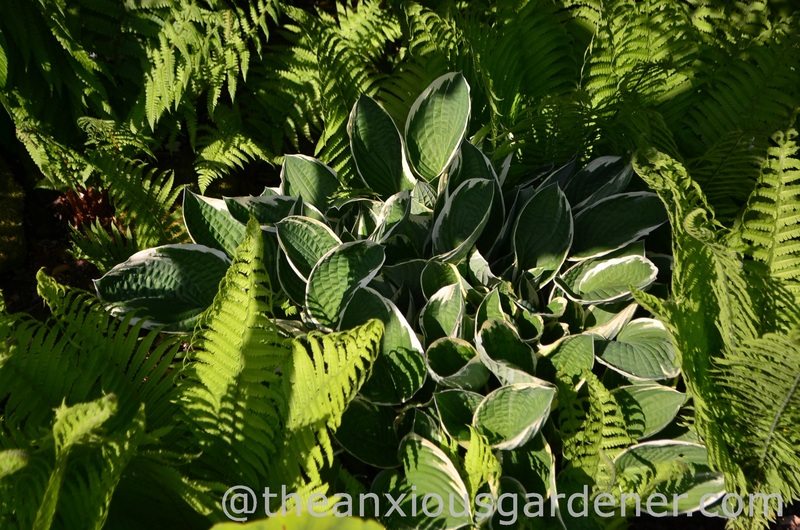 Talking of hostas (seamless isn’t it? 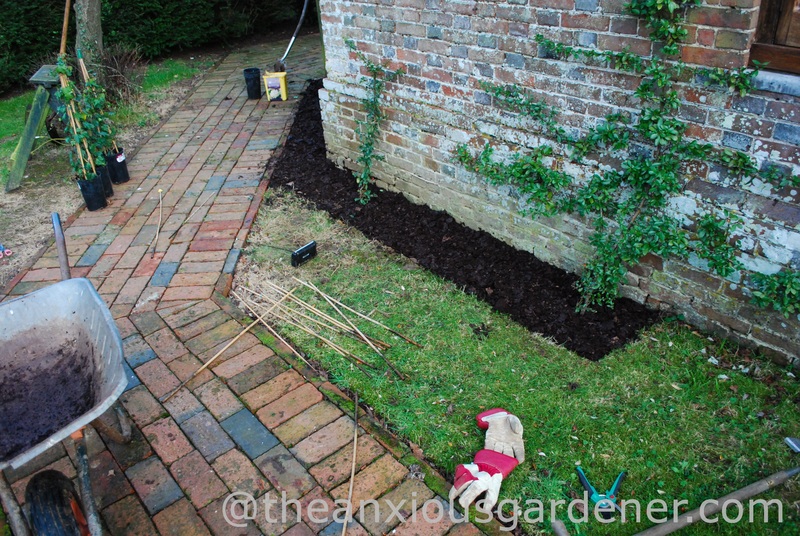 ), in early April I dug up one, spilt it and stuffed the two bits into pots (left). They don’t look like they’ve just been ripped asunder, do they? 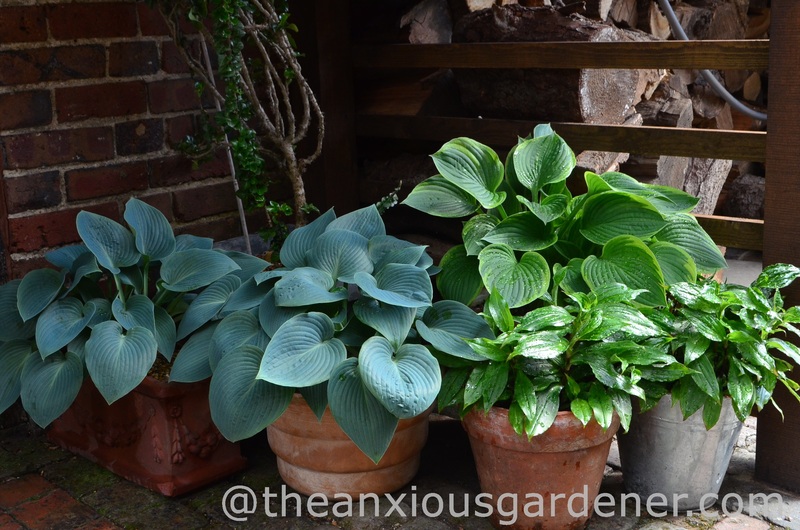 (I’m becoming a little obsessed about hostas in pots. I suspect there might be more next year). 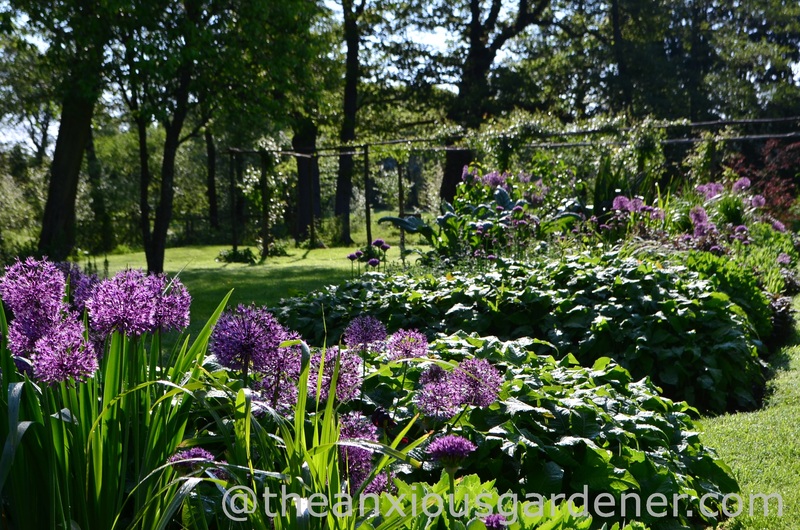 but the alliums are always a delight. 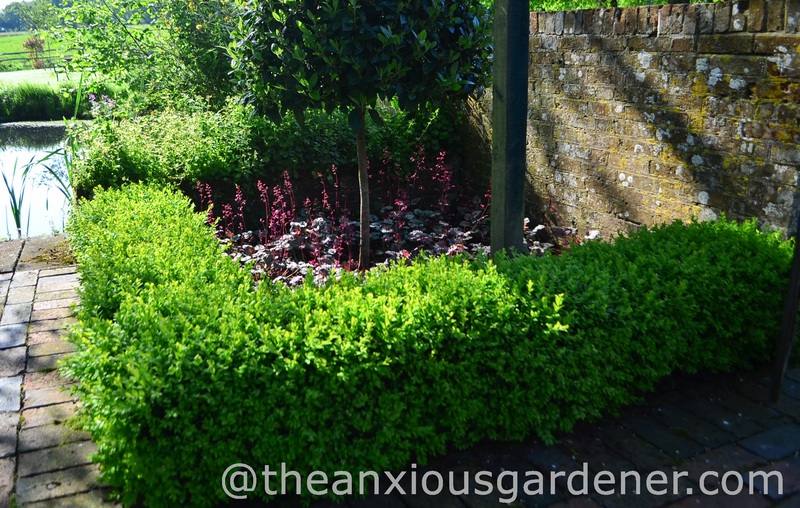 Box hedging is spurting away too and will need trimming soon. 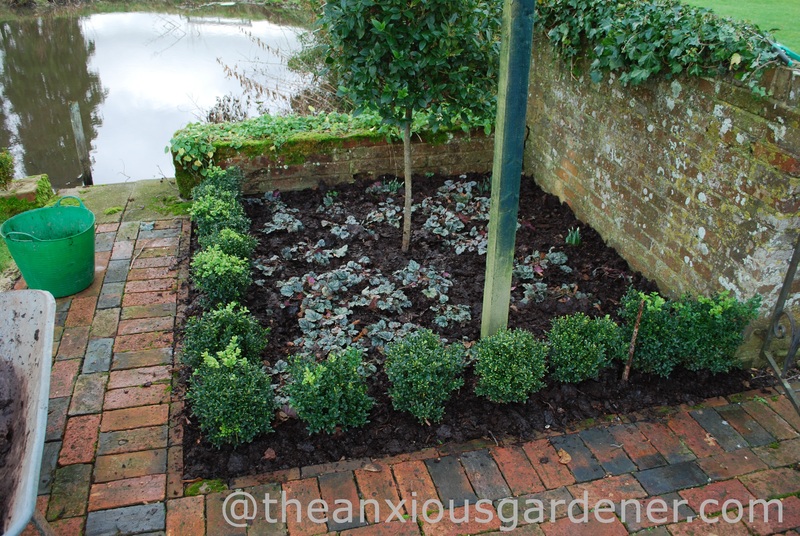 Here I use box to encase a standard Viburnum tinus ‘Eve Price’ underplanted with heuchera. This is what the bed looked like in January 2012. 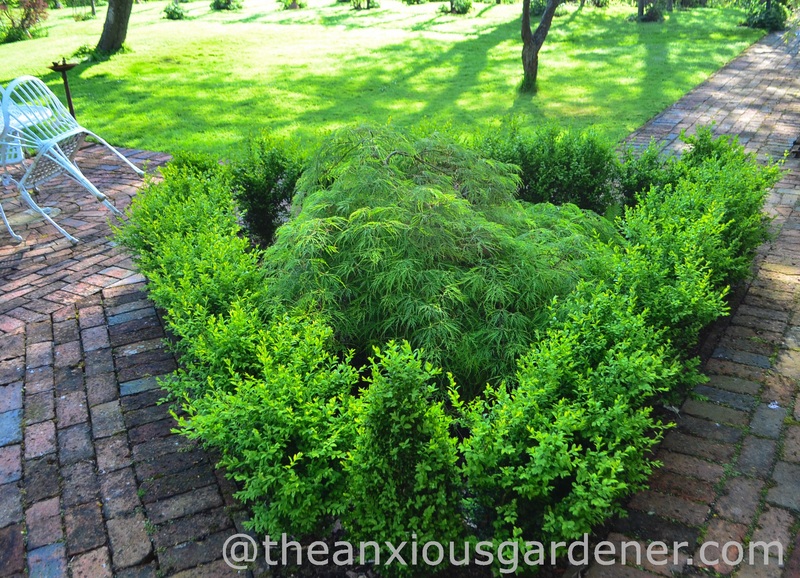 In this triangular bed, I use box to surround an Acer dissectum. The acer has grown far quicker than I was expecting. I shall need to rethink the layout. Last week I dragged the (very heavy) Priory boat over from the east pond and paddled out to the island on the west pond. 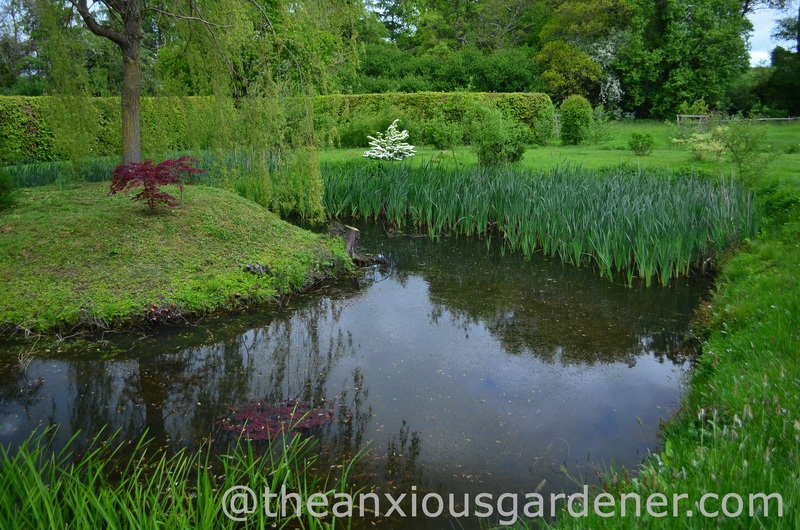 I needed to strim, as undergrowth was swamping the four young acers. It’s looking a bit bald now but the acers will be happier. In the background and going from strength to strength is my startling (and much-loved) Viburnum plicatum ‘Mariesii’. Behind the kidney beds, rhododendrons are in flower. (I told you it was all happening). Honeysuckle perfume is another fine May-marker. 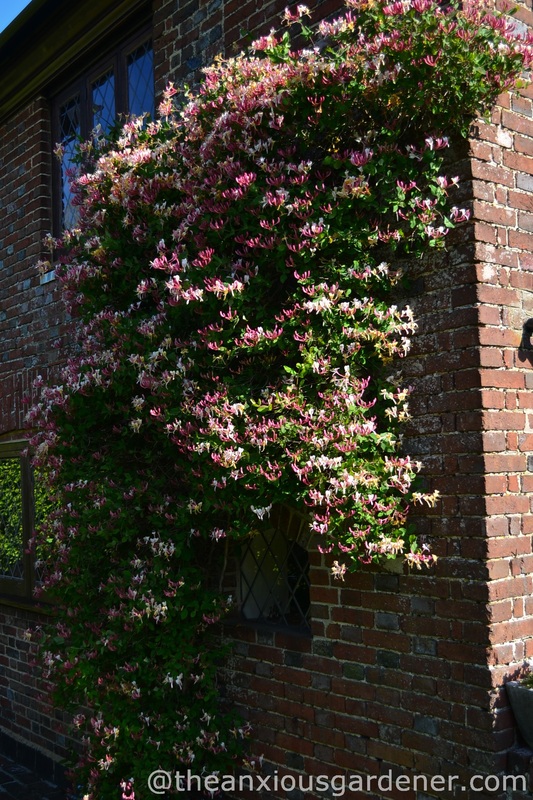 There’s another honeysuckle on the east face of the house. And the everlasting sweet-pea, Lathyrus latifolius, has begun to scramble up a wall with Geranium phaeum in front. 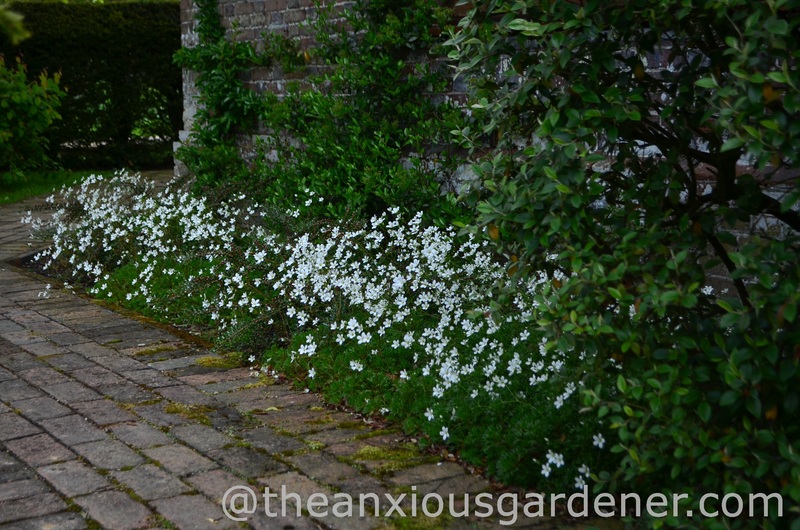 And finally, I’m pleased with a white saxifrage on a west-facing wall. 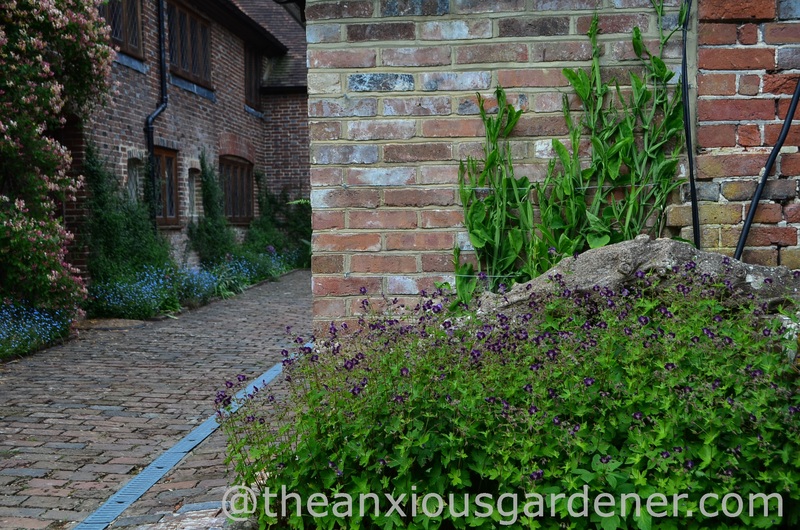 I put them in as stopgap groundcover whilst two Cotoneaster horizontalis matured. This is the same area in January 2012. I had just added a second pyracantha and, oddly, was deliberating about taking out the pointless, ugly patch of lawn. I didn’t hesitate for long. This is only a few snapshots of how the Priory looks on a particular day in May (I’m lying – the above photo was taken the day before). 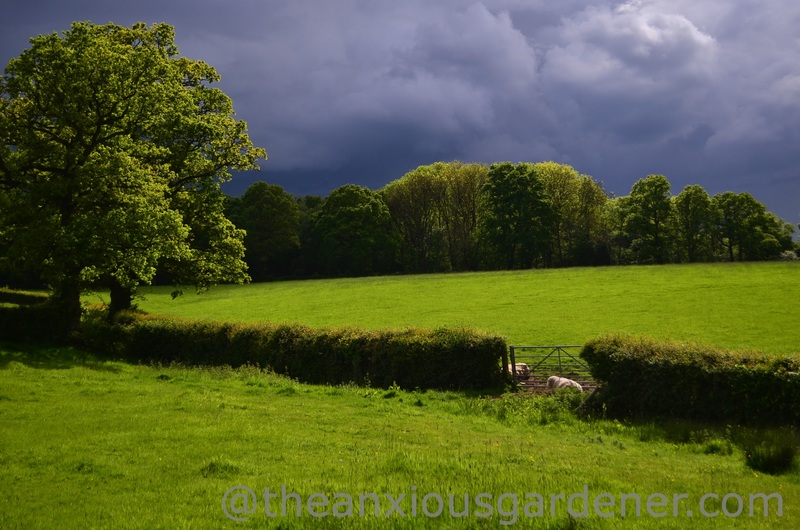 Even with all the excitement in the gardens around the house and within the rabbit proof fencing, my eye also regularly scans the surrounding valley. There is simply too much to notice; let alone to record and photograph. Glorious. 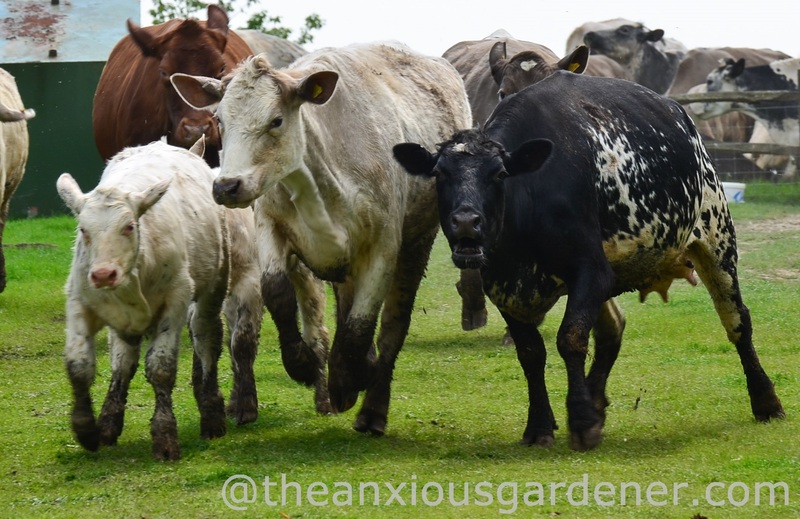 I have grown to love your photos of the cows escaping the confines of the shed at long last, and your long borders are looking rather wonderful. 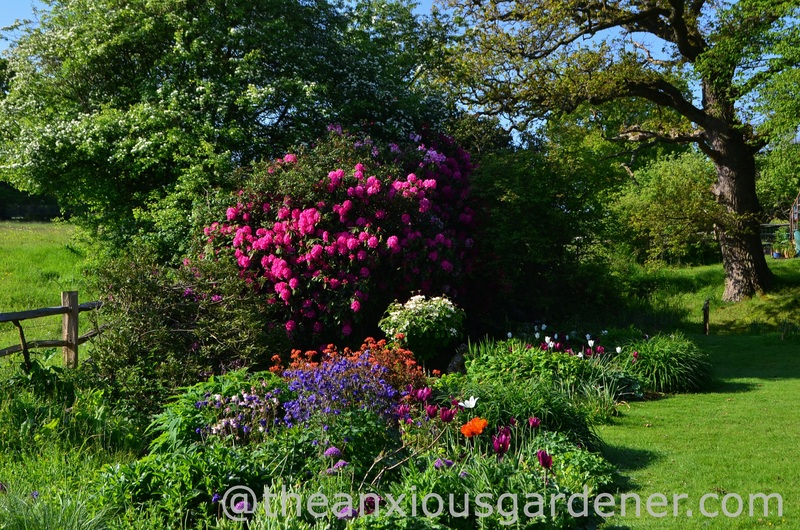 As for the rhodie corner, what a fabulous jolt of colour, I love it. Happy May! Oh, it’s so fun to see photos of Cow Liberation Day! And the Priory looks wonderful. 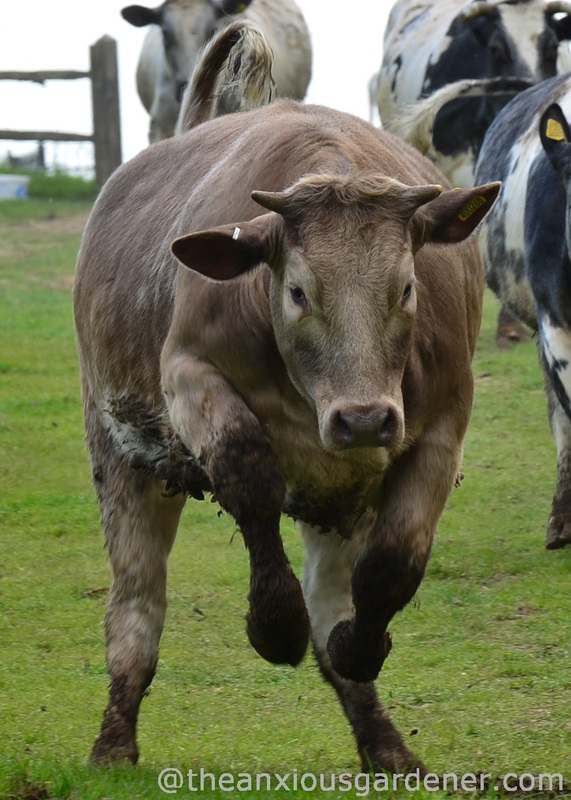 Fantastic photos of the cows. 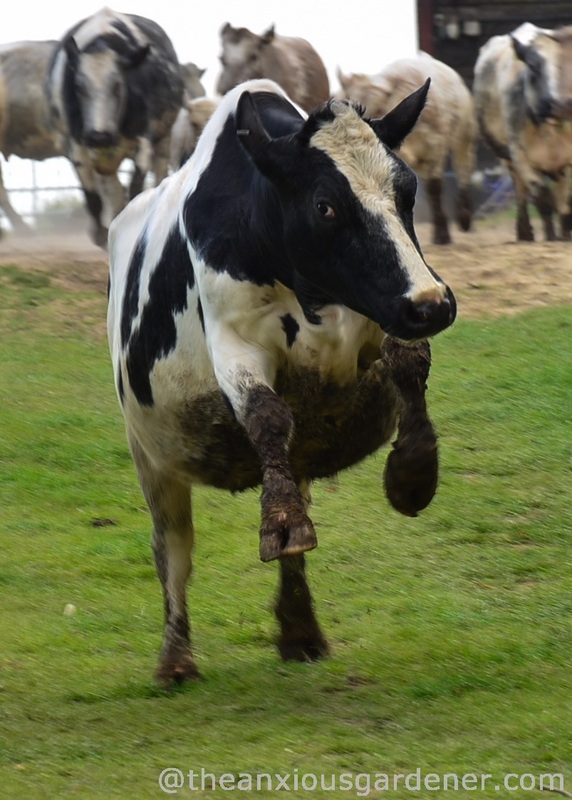 I never think of joy and excitement when I think of cows, but I guess I was wrong! The priory looks great, things are really moving along. It all looks so well cared for, colorful, and promising, but I think I will love the green banana amongst the green ferns most of all. By July it should have a perfect primeval look to it. There are some nice little touches you have added that make all the difference taking the garden out of the ordinary. Some lovely shots Dave – and that honeysuckle, to die for. The way they jump about makes it so clear where they prefer to be. It all looks wonderful, It is a great time of year, if busy. Every day new things seem to have happened. I love the saxifrage. Fantastic, you captured the cows excitement at being let out once more! 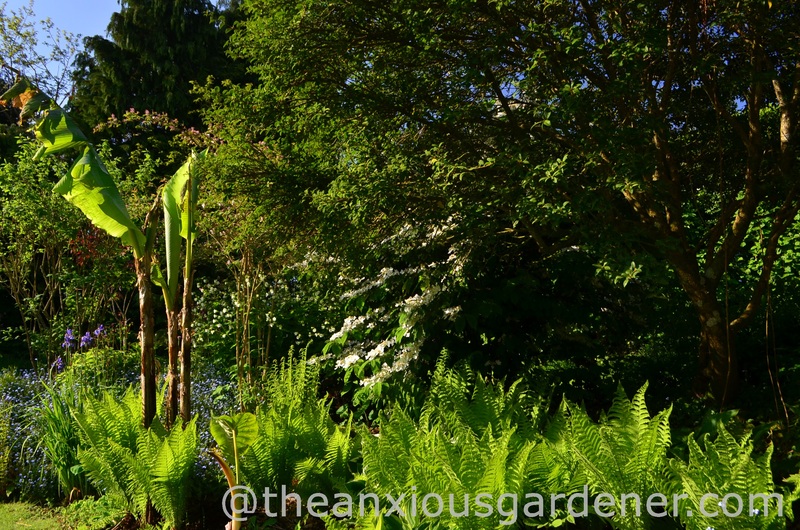 The garden is looking amazing, the alliums, the honeysuckle, love your fern boat, everything is shouting that this is a wonderful time of year! Your gardens look so amazingly healthy and flourishing, I drool. I do love seeing livestock reveling in their first spring release – their joy is contagious. I want to kick up my heels as well! I agree – surprisingly nimble for the tonnage! After the terrible times when so many are slaughtered, I appreciate seeing fields of cows even more. Yours are very nice! Your garden is looking glorious, lots of lovely red brick walls and paths I had not appreciated before. 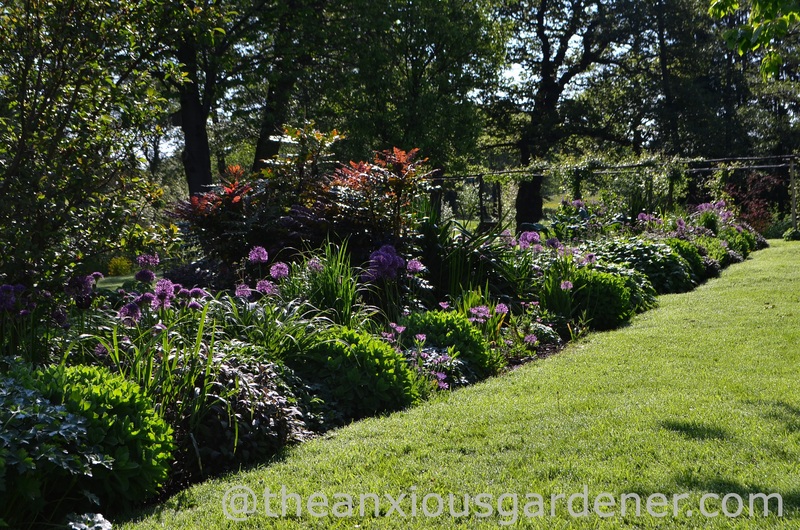 Yes, the alliums are beautiful! How long is their flowering season? Thanks for the info – I will look out for these. It is wonderful that most cows in the UK spend a lot of the year outside, sadly here it is a sight you rarely see. Only sheep are outside. Of course there is less grass for them here in summer perhps here they should be out all winter and in for the summer. Your honeysuckle looks amazing, actually it all looks just like MAY! Lovely! And thanks for the cows, too. Nice to see their joy. Happy weekend! 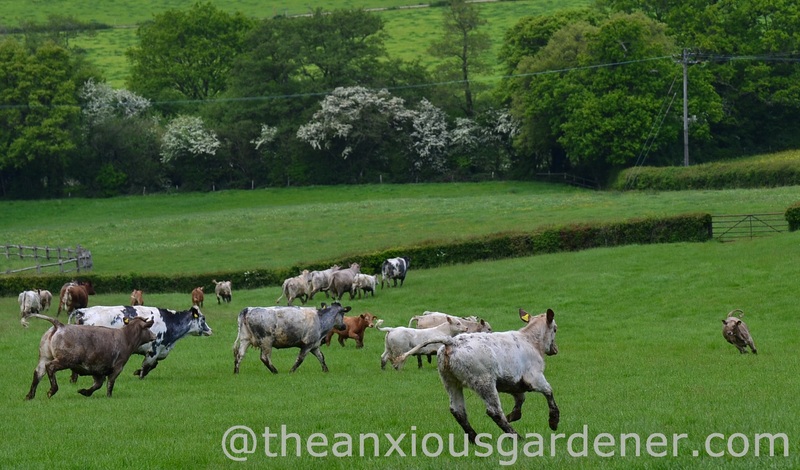 The cows in our back field have been out for a month or more – it is good to see them out. Your honeysuckle is glorious and I love the meadow. Amazing how quickly everything gets going once it starts. Look at how happy the cows are ! Over here more and more farmers keep their cows inside the whole year it is soooo sad ! 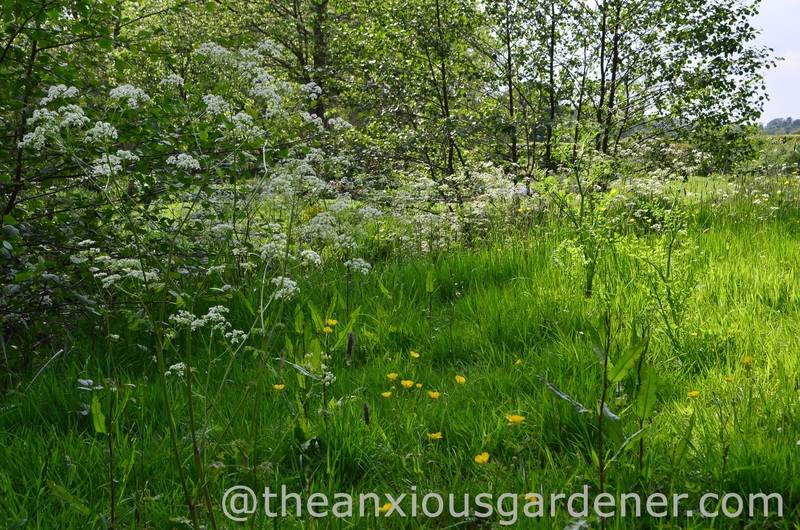 That cow parsley looks suspiciously like the poison hemlock we find on the roadsides over here. Love your blog. animals belong in nature not in a shed !